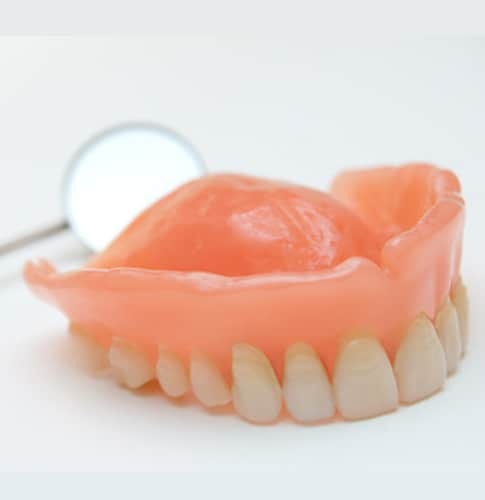 Partial dentures can be made for multiple missing teeth, or even a simple flipper to replace just a couple of teeth. A partial denture requires a few teeth to remain in your mouth, in order to hold the partial in place. The partial will clip onto the remaining teeth, and gives it stability in your mouth. We can use a rigid acrylic material with metal clasps, and the teeth mount on the gum like acrylic. Ot we can use another material called megaflex, which has some flexibility and gum colored clasps to hold on to the teeth. There is also the traditional metal frame partial that has a metal skeleton, overlaid with gum colored material and the teeth are then mounted on the gum like material. The dentist will advise you as to the options, and which materials will work best in your case. With regard to full dentures, there are immediate dentures, and dentures that are more permanent. The immediate denture is made from an impression made before the extractions, and is ready to put into your mouth at the time of the extractions. It has medicated lining, and will aid in healing. However, because the gum will be shrinking, and the contours changing until the gum is healed up completely, the immediate dentures don’t usually fit the best, and will need several adjustments. After about 6 months of healing, we can make a more permanent denture that should fit comfortably for any years Your options are Lucetone, which are lightweight, and Megaflex, which are soft. TCS appears more aesthetic sine they can take the color of your real gums.